Life is a whirlwind currently! I’ve been slammed with academics, college applications, and social events for the last few weeks and it has been a wild time. However, I did manage to squeeze in time to prepare this 2 Ingredient Fudge! It’s a perfect recipe for the upcoming holiday season and I have a feeling that everyone will love this simple treat! 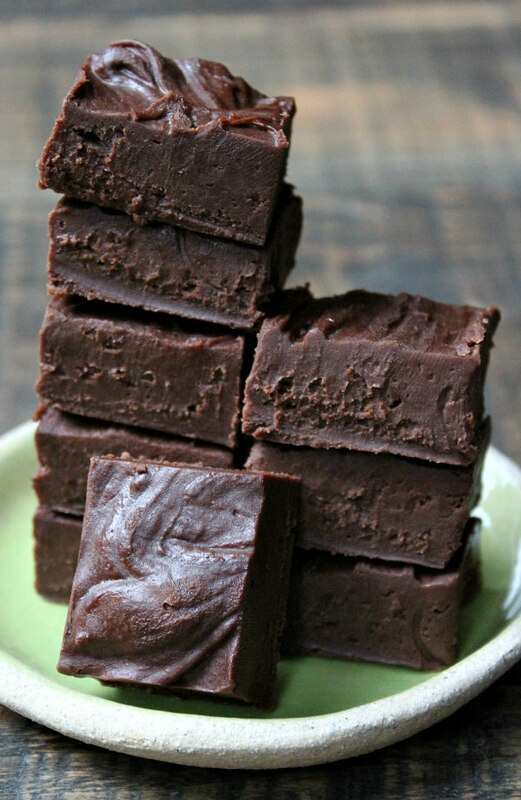 Watch the video showing you how to prepare this fudge recipe, then scroll to the bottom of this post and print out the recipe so you can make it at home. Most people would assume that this is a picture of ordinary fudge stored in the back of the freezer until Christmas comes along… This isn’t the case. 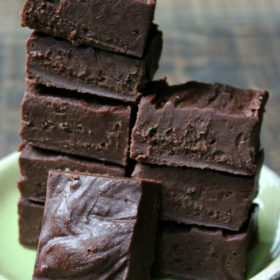 This fudge is unique because it only contains TWO ingredients: chocolate chips and cream cheese frosting. Before making this recipe, I never would have assumed that chocolate chips and a can of frosting could pair together to make fudge. All you have to do is melt the frosting in the microwave. Then melt the chocolate chips and stir until smooth. 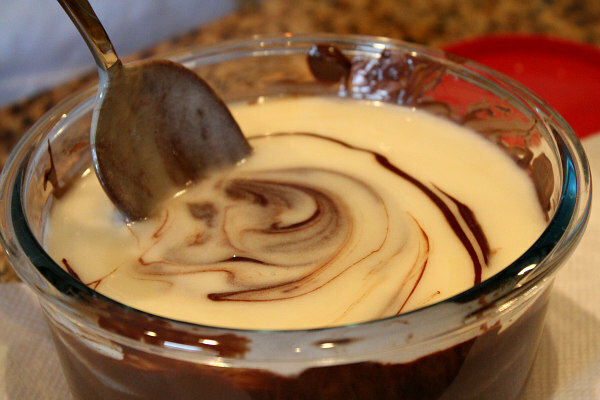 Then you’ll combine the two melted ingredients together. Stir until smooth! The mixture looked incredible! It reminded me of a cookies and cream themed fudge. After I kept mixing, however, the fudge turned entirely brown. Tessie! I’m sure that everyone remembers my adorable dog and assistant. She helps me frequently in the kitchen by keeping an eye on what I’m making and taking care of anything that might fall on the floor! 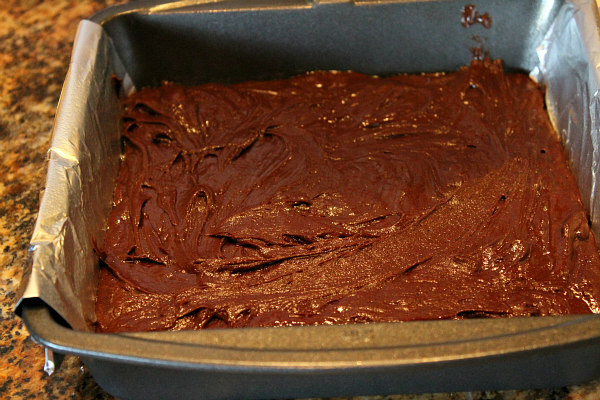 The fudge mixture is scraped into a pan, and then it’s ready to be chilled! It took approximately two minutes to prepare everything up to this point, so I’d say that is a worthy use of time! So many squares! I am a huge fan of fudge, no matter how complicated it may be. Initially, I thought that this fudge would be somewhat sub-par compared to more complicated fudge recipes, but that was not the case at all. 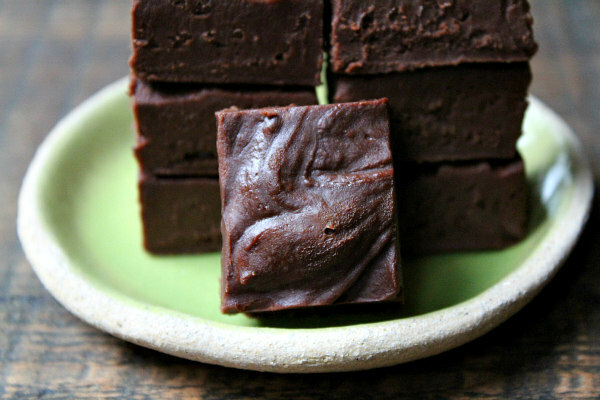 This fudge is so much better than most fudge recipes I’ve tried. 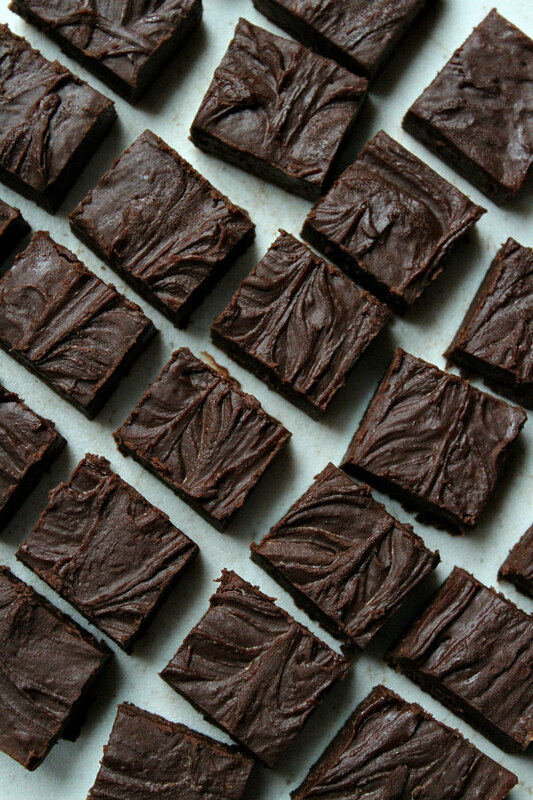 These squares of fudge are absolutely beautiful! I’d highly recommend this simple recipe to everyone preparing for the holiday season. 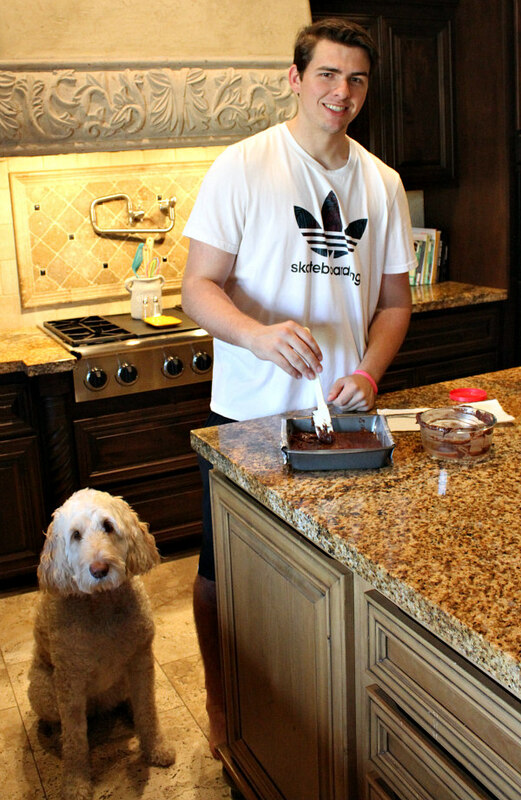 This fudge will definitely become a family favorite for the Lange household! I am glad that I found time to return to my blog because of how crazy the last few weeks have been… I love writing about my everyday life and sharing my experiences with all of you. I am dedicated to keeping up my website and discovering/creating new recipes every day. Thank you all for sticking with me! If you’re looking for more easy dessert recipes, you might also enjoy my Easy Ice Cream Sandwich Cake or these Chocolate Chip Cookie Dough Stuffed Oreos. Strawberry Shortcake Kebabs, Easy Chocolate Chip Cookie Bars and No Bake S’Mores Bars are easy desserts to make too! Line an 8x8-inch pan with foil and spray with nonstick spray. Melt the frosting by heating it in the microwave for about 30 seconds. 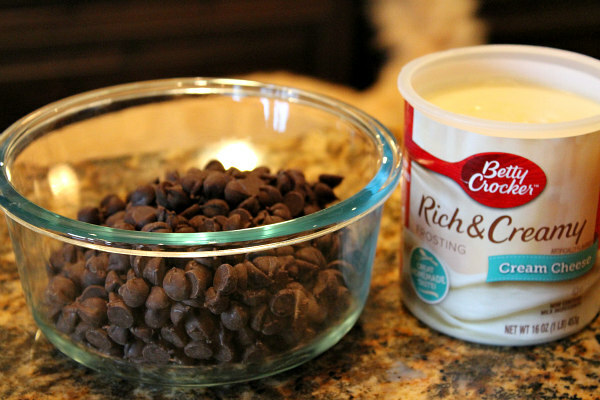 Put the chocolate chips in a microwave-safe bowl (or melt them in a saucepan over low heat). Microwave one minute, stir, then microwave in 30-second intervals until the chocolate chips are completely melted and smooth. 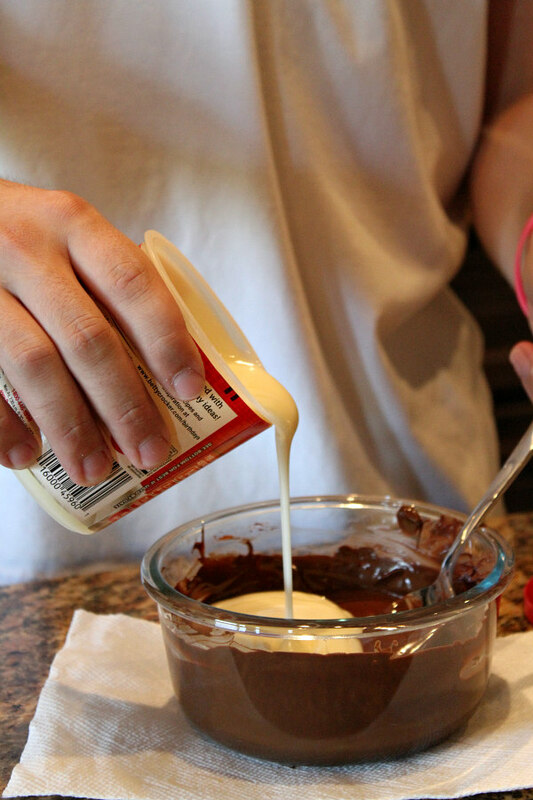 Add the melted frosting to the bowl and stir until completely combined. Scrape the fudge mixture into the prepared pan. Let sit at room temperature until firm, or refrigerate to speed up the process. Cut the fudge into pieces. Store in a covered container, and eat within about 3 days. This fudge freezes well too.